Want Some Lunch? Shore Do! Paul and Jeff H., father and son from North Carolina and Pennsylvania respectively, are smacking their lips as they anticipate delivery of fresh Silver Salmon to their plates. Paul and Jeff have fished with us several times, but for the first time they did an overnight at Yantarni. 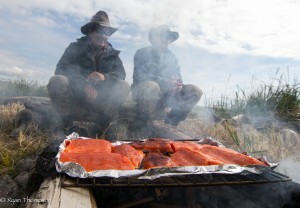 We treated them to a fresh-caught shore lunch of salmon, cooked over a fire of red cedar wood beach combed and split just for the job earlier in the day. Yantarni chef Jason prepared three different recipes: honey glaze, teriyaki glaze and maple syrup glazed. All were excellent. The crash of the surf nearby added to the ambiance.